Steve Hicks is a maker of early and modern fretted instruments with over 40 years experience and is a virtuoso fingerstyle guitarist drawing on European and North American Music Traditions. Born in South Ockendon Essex, Steve has an international reputation for his fine custom built instruments and is critically acclaimed for being one of the best fingerpickers around. Fingerstyle Guitar legend Duck Baker. Steve graduated from London Guildhall University with highest honours in Musical Instrument Technology, (early fretted instruments specialist). For many years he has served in the capacity of student feedback mentor and concert artist to Clyde College department of musical instrument making and repair Glasgow, Scotland and also to Lincoln College department of musical instrument craft Newark Campus, Nottinghamshire England. 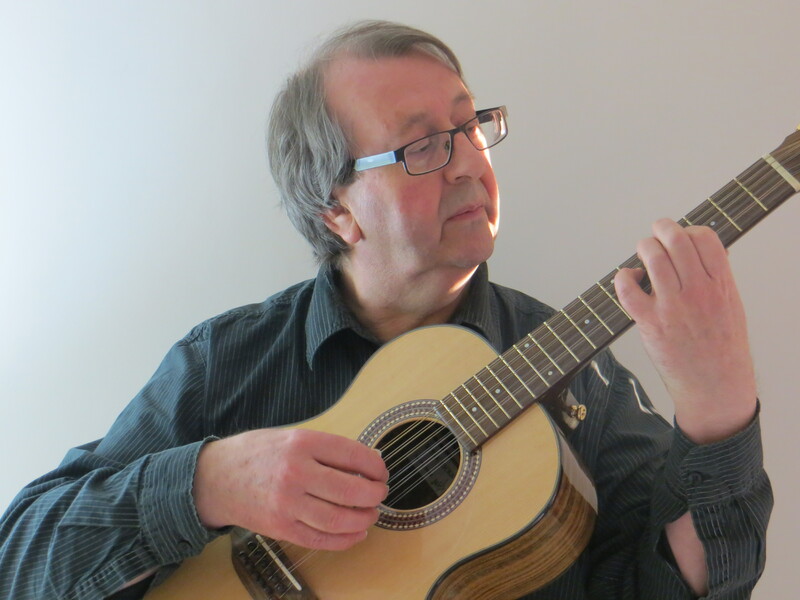 In 2015/16 Steve served as adjunct faculty for Dept of Music Technology at Confetti, De Montfort University Nottingham Campus and as advisor to the Carolan Guitar project dept, of computer sciences Nottingham University. As a guitarist Steve is signed to Acoustic Music Records in Germany, a prestigious guitar music record label owned and run by world renowned guitarist composer Peter Finger. Steve has released two critically acclaimed solo CDs on this label and is featured on two compilations. This CD has recently been selected for review by New York Jazz magazine and an interview for the magazine is forthcoming. Described by Jazz Podium Magazine as, ‘a collection mercurial masterpieces’, whilst Blues in Britain Magazine awarded 9 stars out of 10. Steve has also been the subject of an extensive article/interview for Akustik Gitarre Mar/Apr 2010 edition) Germany’s largest magazine dedicated to Acoustic Guitar. For the 2016 tour Steve was engaged to play the first leg consisting of 10 shows in 10 days. Almost all the shows were sold out in advance. ‘Owl Café’ (2011) Striatum Records. In 2014 Steve was awarded by K.Yairi Guitars of Japan the K. Yairi Steve Hicks Signature Guitar Presentation Model in respect of Steve’s concerts and demonstration shows for K. Yairi Guitars at the Acoustic Avalon Guitar Show. Steve’s guitar building projects for 2017 include specially designed Hicks Requinto Guitars. Just off the bench is a flamenco version for Duck Baker and next will be an arch top cutaway version for Lynn Goulbourn. Steve will also build a new model steel string guitar for sale through Guitar Basar, the guitar retail wing of Acoustic Music Records, Osnabruck, Germany. This guitar will be specially designed for Ragtime and traditional fingerpicking techniques. Another exciting project is to be one possibly two Hicks Baroque guitars for completion. These will be offered for sale. At the end of the year Sunday Dec 17th Steve will make his second appearance, (last time was in 2013), at the Big Night of Acoustic Guitar x 5 in Bochum Germany with an international line up.